The New India Assurance Company Limited is one of the leading public sectors General Insurance Company under Government of India. NIACL have group of various offices everywhere in India and overseas. NIACL Recruitment department invites online Government job applications from all eligible Indian Citizens for the recruitment of Assistants in Class III cadre from the open market. Indian candidates are requested to apply through online mode only for these insurance jobs, between 16th July 2018 to 31st July 2018 (both days inclusive). No other means mode of application will be accepted for these Government jobs in India. The NIACL (New India Assurance Company Limited) would coordinate an online examination and after that, a local Language Test will take place to shortlisted the candidates would be conducted by the Company in the respective zones where Regional offices are located. 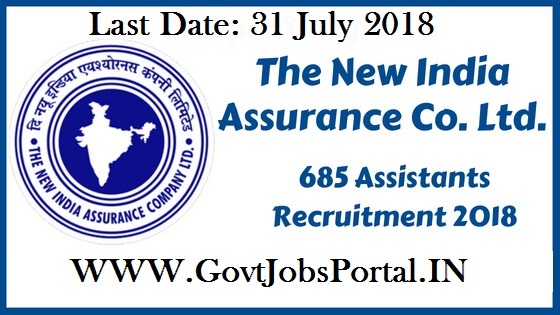 More information about this New Indian Assurance recruitment is given below in this post. Read whole post carefully before applying these insurance jobs in India. What are the eligibility criteria for this NIACL Recruitment? Education: Indian fresher Graduates can apply for these insurance jobs in India. Candidates who pass out in their Graduation degree in any stream can apply for this NICAL Recruitment 2018. Age Bond: Candidates whose age lies in between 21 years to 30 years can apply for these insurance sector jobs in India 2018. What we have to pay for applying these Government jobs in India? Pay the fee through Debit Card, Credit Card, Net Banking for this NICAL Recruitment. What is the process for applying this NICAL Recruitment? Those who are eligible to apply these Government jobs in Insurance sector can apply online through the official website only. The link for applying online will be activated on 16th July 2018. The link for applying online will be expired on 31st July 2018. You have to apply online between these dates. What is the Process for Selection for these Insurance jobs? Candidates will be selected on the basis of written examination after that Local language test will take place for final selection. Those who cleared both these rounds of selection will be appointed for that job profile. 16th July 2018 is the Starting Date for applying. 31st July 2018 is the Last Date for applying.